We are pleased to announce Aeternity (AE) has launched on f2pool labs – the first mining pool in the world to support AE mining. Aeternity is a platform with the ability to create decentralized applications. It is presented as an improved alternative to the well-known Ethereum platform, it solves the problems of scalability, improves the security of scripts and makes access to smart contracts more economical. For the miners out there – the Cuckoo Cycle algorithm used by AE currently supports N-card and A-card mining, minerOS needs to be used and requires at least 4 GB of memory. Gate Exchange has now supported the AE mainnet coins’ deposit and withdraw. You must use the mainnet wallet address starting with “ak_” to receive mining revenue. Regulatory policies related to cryptocurrency mining differ in each country, and each miner is responsible to understand the associated risks. AE coins can currently be mined through Bminer, Miner Master, Easy Miner and MinerOS, which are described separately below. Please set up the software according to the parameters within this mining guide. Set the AE pool URL and port number, and set your own AE wallet address and worker name as shown in the image above. If you have multiple miners, the worker name is used to distinguish between different machines. The wallet address and worker name should be separated by a period “.”. Do not delete any spaces or punctuation marks when modifying the file, as that will cause the file to be corrupted. Please save the file after the modifications are completed. After save the “start.bat” file and then double-click to start mining. After logging in to the official website, click “下载单机挖矿安装包” (Download Single Machine Installation Package). After the download is complete, run the installation program to finish the installation. If you have many mining machines and require batch management, you can download the “内网批量管理安装包” (Intranet Batch Management Installation Package) and need to cooperate with Miner Master to use. For more details, please check the tutorial on Miner Master official website. Set the worker number to distinguish between different mining machines, which can be a combination of numbers or letters. In the AE wallet textbox , fill in your AE mainnet wallet address. Once the setup is complete, click on “start mining”. Worker Name: Give a name to distinguish between different mining machines, which can be a combination of numbers or letters. 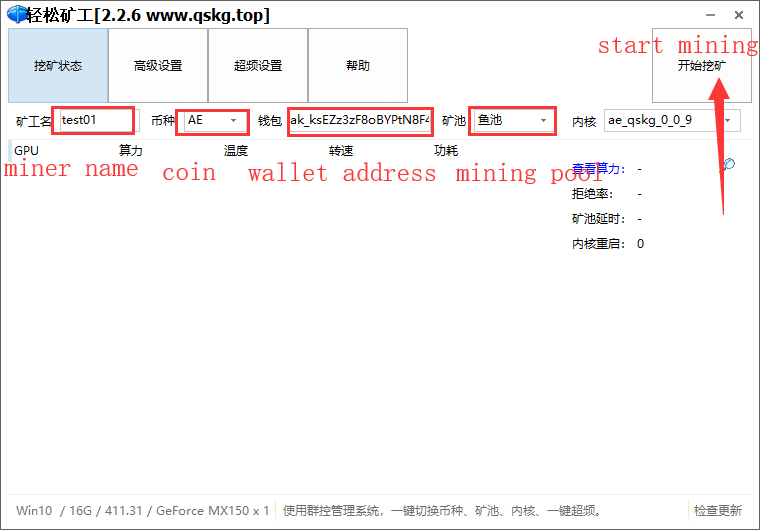 Wallet Address: Set your AE main network wallet address (the main network wallet address starts with “ak_”) to receive mining revenue. Now you’re ready to start mining! The hash rate of Easy Miner (轻松矿工) is the share value, and the actual hash rate is displayed on the mining pool. AE mining requires high virtual memory: 1080Ti single GPU card needs 8GB virtual memory, so six 1080Ti cards need a total of 48GB virtual memory; 1070, 1070Ti, 1080 single card requires 6GB virtual memory on average, therefore a six-card mining machine needs 36GB of virtual memory. The graphics card driver requires the version 397.00 or higher. In the above picture, in the lower left corner: “Win10/16G/411.31/GeForce MX150 × 1” represents the following: system version/virtual memory size/current graphics card driver version/GPU model× GPU quantities. This can be used as a reference for your graphics card driver test. For miners who have not installed minerOS, first register a minerOS account (HERE). Miners who have already installed minerOS can skip the installation and upgrade to 1.6.6 or above. Prepare a 16 GB (or larger) U disk or mobile hard disk, click here to download and set up to V1.1.6 version (or above). After the download is complete, burn minerOS to a USB flash drive or mobile hard disk. The version number for N-card is 1.6.6.NK1518D410, for A-card is 1.6.6.AK1808D1803. Insert the burned U disk or mobile hard disk into the mining machine. After the machine is turned on, it will automatically activate the minerOS account, which has just been registered. You can log in via minerOS to operate the mining machine. Please note: This is a simplified installation process. For more details, please refer to the “minerOS installation tutorial”. Note: When using A-card mining, in addition to the Vega series, the mainboard must have a slot with Gen3 and Pci3 speed , the RAM must be at least 4G. The A card 3 series is currently not supported. After completing the above minerOS installation, log in to minerOS to operate the mining machine. Set up a new miner template. In the left navigation bar, click on “Drilling Template” and click on the blue “+” icon on the right side. The default mining program is “koel-cuckoo”. Please pay attention to the type of graphic cards. The default version is 1.0.11; the overclocking function is not supported at this time, and its default is off. Enter “-auto_restart 3600” in the “Custom Parameters” text box. There should be no spaces before or after this parameter. After the setup is completed, click the OK button at the bottom of the page. After the setup is finished, the newly created template will appear in the mining template list. Configure the newly created mining template to the host. Click “Host” in the left navigation menu, and find the mining machine to be configured in the list. In the “Operation” column, click the “Configure and Restart” button to enter the next page. On the current operation page, select the just created “AE-鱼池” mining template, click “确定” and “是” in the pop-up dialog box. After the configuration is completed, the mining will start. 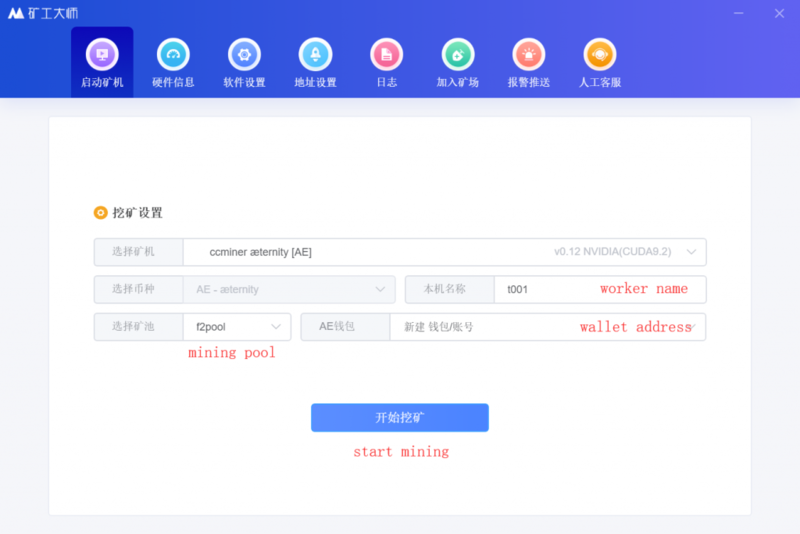 To view the operational status and daily income of the mining machine, you can access the f2pool official website, click on the search bar in the upper right corner, and enter the wallet address to check. You can also view the information through our f2pool app. From the login screen, select “Quick View” in the bottom right corner and enter your wallet address. Please note: After you set up your miner, it may take a little time before your mining data will sync with the f2pool website and app. Having issues? Send us an email at support@f2pool.com or find us on Discord.